It's super easy to get started with .NET Core and/or ASP.NET Core with Docker. If you have Docker installed you don't need to install anything to try out .NET Core, of course. 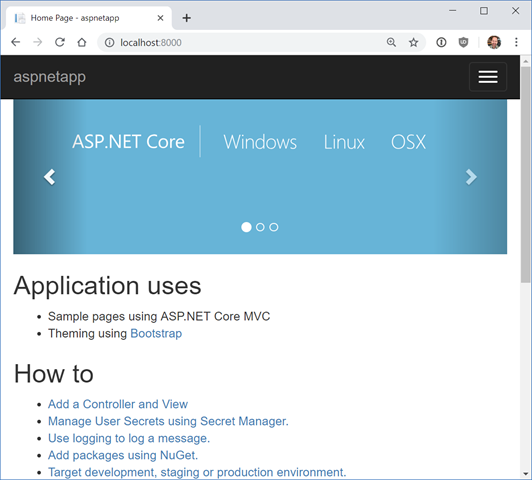 You can also host ASP.NET Core Images with Docker over HTTPS to with this image, or run ASP.NET Core apps in Windows Containers. Note that Microsoft teams are now publishing container images to the MCR (Microsoft Container Registry) so they can use the Azure CDN and pull faster when they are closer to you globally. The images start at MCR and then can be syndicated to other container registries. docker build --pull --target testrunner -t podcast:test . I can then either host the Docker container in Azure App Service for Containers, or as little one-off per-second billed instances with Azure Container Instances (ACI). Have you been using .NET Core in Docker? How has it been going for you? We're using Azure Kubernetes to host Docker containers with .NET Core 2.1 apps (backend and frontend), it's great to scale easily. Also, we use .NET Core within Docker in the DevOps C.I. (builds) to run no-traditional tests, like execution of the app. Hosting using Docker is fine. The problem why it's fairly difficult to start using it professionally (everything should be hosted on-premise) is because there are no official Docker Registry images running on Windows and for someone how never used Unix systems it becomes a hurdle. We're run full Windows Container in the company(intranet), not easy work. Is there some way to find out what ISNT supported in Windows docker images? I’ve been unable to find any real information about the differences between a docker Windows image and a real OS install. It kind of undermines the value of containers if they’re not *exactly* the same as the true OS. Could somebody tell which version of Windows is required to run Windows Docker images in production? If I am reading the licensing correctly, it is Windows Server Datacenter edition. Am I wrong? If you have some suggestions, I will be happy to incorporate ! Simple docker-compose example of stateful microservice (your own selfhosted private registry) published to internet using automated LetsEncrypt. This is example. This is not deeply-tested production-ready solution. Nginx need some tuning to be good reverse proxy for production usage. I am using similar config as ingress in k8s with edited nginx buffers. Fantastic ! I m really very gratitude to you website to give a chance for sharing blog with us.